A superb trek in the Berber villages and mountains of the Jebel Sirwa region. Fly to Marrakesh. Transfer to your chosen hotel. Drive over the High Atlas. Visit Kasbah Ait Ben Haddou and continue onwards to the town of Ouarzazate. Travel to the centre of the Sirwa mountains, via Anzal Tachakouch. Arrive at Amassine, meet your trek crew. Trek in the Sirwa region, a volcanic landscape situated between the High Atlas and the Anti Atlas, dominated by Jebel Sirwa summit. End the trek. Meet your transport and drive to Taroudant. Drive over the Tizi n Test pass, travelling past the Tinmel Mosque to Ourigane. A day trek around the villages and the salt mine of Ourigane, towards Tassa Ouirigane. Drive down to the plain of Haouz and on to Marrakesh. Two days at leisure in Marrakesh. Relax, explore the city by yourself, or we can organise a tour guide or activity for you. Transfer to the airport for your international flight. An adventurous holiday for children and teens, with a trek and desert camel ride. Fly to Marrakesh. Half day sightseeing tour and time at leisure. Drive southeast of Marrakesh to Ourzazate. Continue on to Tiglit and Taghssa. Meet your muleteers and walk to Imi N’oaurg. (2 hours). Walk up the valley to the summit of Kouach (2,590m). Enjoy a picnic lunch below the summit and then descend to Tassigdelt. (6 hours walking). Descend to Igli, continue to Afourar village. Walk along the Afourar Gorge and climb a short way to make camp at Bab n’Ali - beneath rock outcrops. (Approximately 5 hours walking). Optional walk to the waterfall in the afternoon. Walk up past two megaliths of Bab n’Ali and across to Tadaout, passing nomad encampments on the way. Trek over the col to Tizi Taggout. Continue the trek to Irhuassoun. (5 hours walking). In the afternoon visit a Berber family. 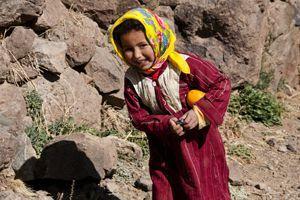 Trek through a Berber village. Cross the ridge to Handour for lunch. Say goodbye to your trek crew and meet your transport. Drive to Rissani, an oasis where sand dunes can first be seen and onward to Merzourga. Meet your camels and head off to a Berber camp in the Erg Chebbi dunes. Spend the day in the dunes, take a camel ride or climb the highest dunes of the Erg Chebbi, with views towards the Algerian Sahara. Take camels to Merzourga. Drive to Ouarzouzarte and continue for a short distance to Ait Benadhou, a fortified ksar (city). Visit the ancient Kasbah. Drive back over the Tizi Tichka pass to Marrakesh. Afternoon at leisure in Marrakesh. Shop for souvenirs and any further sightseeing. You could take a caleche (horse and cart) ride around the city.